Sergeant Gordon Morgenthaler who presented the information to the South Area Committee on Thursday the 2nd of April 2009 said : “That’s horrendous … The shocker was the amount of speeding in the middle of day, including at weekends”. He’s right, it is horrendous, it clearly shows the police are failing to enforce the law here. The police offered no explanation as to why they were allowing this situation to occur and why action had not already been taken. The speed limit on Queen Edith’s Way is 30mph. The police stated that they were to begin offering drivers caught speeding between 30-40 mph in a 30mph limit the opportunity to go on a speed awareness course, it was reported that this was new to Cambridgeshire. (It has been reported elsewhere that offering these courses in Cambridgeshire began in April 2009). I would be very concerned if, now the courses are available, the police are considering prosecuting people at speeds which they would not previously have taken any action at. Given we have people travelling at 57 mph down this road it is not those going at 32 mph who need to be targeted. Elsewhere in the country it has been reported that there has been action taken against those travelling at 32mph in a 30 zone; this has been linked to the initiation of speed-awareness courses. As action against those going 2mph over the limit doesn’t target resources where the biggest problem is I think such a heavy handed approach is likely to result in drivers watching their speedometers rather than the road and damaging the relationship between the police and those making a reasonable effort to comply with the law. We need enforcement, but it needs to be done rationally, with a degree of common sense and targeting those driving at dangerous speeds. On the subject of speed awareness courses I have suggested to members of the Police Authority that it ought not be necessary, as it is now, to return to the force area where the offence was committed in order to attend a course. Over 500 motorists were identified as exceeded the speed limit. Given apparent difference I have verified that Sgt. Morgenthaler’s statement to the meeting quoting 32,500 vehicles speeding in a week was accurate before publishing this article. 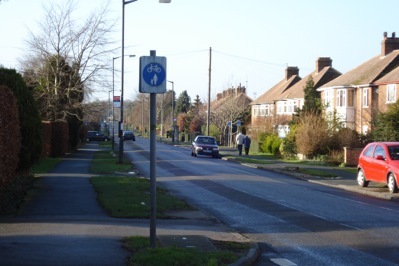 The police noted that residents had thought that speeding was worst at night, but the survey, conducted using on-road sensors, had shown it was a problem throughout the day. The survey also showed there is clearly very little congestion problem on this road. If Cambridge had a Southern by-pass then less through traffic in a hurry would be using this road which currently fulfills the role of a Southern ring road. It is fantastic that we have a long straight road which takes people quickly from one area of the city to the other, its a shame people aren’t obeying the law and using it responsibly. Less ambitious than a new road – perhaps some judicious use of paint might be effective, painting stretches of the road red (as in Horningsea) or painting narrower lanes might slow traffic. Clearer signage of the presence of the school, particularly during relevant hours might also be worthwhile. Such simple and cheap methods, coupled with effective enforcement targeted at the worst offenders would be my preferred suggestion. If any speed reducing measures could provide additional benefits to cyclists that would clearly be desirable particularly on this road which has poor provision for cyclists given its usage and location. Photograph from CycleStreets.net, licensed under the CC Attribution-Share Alike license. This entry was tagged Cambridge, Police, Queen Edith's on April 4, 2009 by Richard Taylor. 32,000 speeding drivers caught in one week – Article in The Telegraph. BBC Radio Cambridgeshire have just reported that Cambridgeshire Police have appointed Drive Tech to run their speed awareness courses. This is a company which it was reported made an ex-policeman a £1.3million dividend last year. I don’t think we should be focusing on extorting money out of those doing 32 or 34 mph when we’ve got people speeding dangerously at twice the speed limit. I think the Cambridgeshire Police Authority ought review the force policy for use of Speed Awareness Courses; they ought to have considered how they are to be used prior to their introduction to the region. I agree, and am therefore concerned with the local implementation here in Cambridgeshire. If there were no accidents at this site then it could be argued that drivers were driving at a speed they considered to be safe. After all, safe driving and avoidance of accidents is the key, not numbers on a display. That such a large fraction of vehicles are speeding suggests a problem with the physical layout of the road and/or the limit itsself. With such a large fraction of drivers breaking the law to such a degree something does need to be done. In this particular case I think a genuine problem on this road has been identified. I’m not anti-car and a don’t support the Lib Dem’s headlong attempts to reduce speed-limits in Cambridge but I do think that such speeding on Queen Ediths’ Way is worth tackling; not least to encourage more cycling and walking to the schools on the road and in the area. In terms of accidents, the roundabout, and junctions at either end are hotspots as would be expected, but otherwise the accidents are spread out along the length. There isn’t a hot-spot for accidents on the straight of Queen Ediths’ Way as there is on the adjacent Mowbray Road; but accidents are spread over the whole length of Queen Edith’s Way, and there do appear to me to be more accidents not associated with junctions on Queen Edith’s way than on other roads. It makes a complete mockery of the system if we have areas of the city were the speed-limits are being flouted so routinely. I think where speed limits are inappropriate they ought be reviewed. The law has to be enforced, and not enforced selectively (as that’s open to abuse). The physical features of the road ought be used to make it safe, safety shouldn’t rely on enforcement. I am concerned about the Liberal Democrat’s approach to speed limits in the city which appears to me to have nothing to do with safety and to be based on a number of councillor’s dislike of motor vehicles (and crazy visions of Cambridge as a city without them!). I overheard some Liberal Democrats recently talking about Long Road; they consider the fact that they’ve still got one or two forty limits on their patch something which needs addressing without consideration of the road itsself and how it is used. Following the expansion of 20mph zones, and the police starting to enforce them, I think it will be wrong to see people sentenced for speeding at 40mph with disqualification and 6 points whereas they would currently only expect 3 points. Of course as they’re there the limits have to be followed, but once the number of people having their lives and livelihoods destroyed despite having only behaved safely rises I expect people will start thinking twice before putting their cross next to the Lib Dem box; be they regular drivers in Cambridge or not. As these results from Queen Edith’s Way show speeding problems in Cambridge aren’t about people doing 30 or 32 mph. As I’ve written elsewhere I think taxis speeding on Friday and Saturday nights, when the police have openly said they’re too busy to enforce speed limits at this time are particularly problematic. See also my article entitled: “Cambridge Councillors Ask Police to Tackle Speeding” which contains a section on my views.